Tristan took this photo from beside that dam. Google Earth is an accidental Dali. The shading and colouration make that look like a screenshot from Half Life 2. For those who like Google Earth as much as I do, the Google Earth Blog bears examining. The Glen Canyon Dam is also featured on Google Sightseeing: a site I recommend. 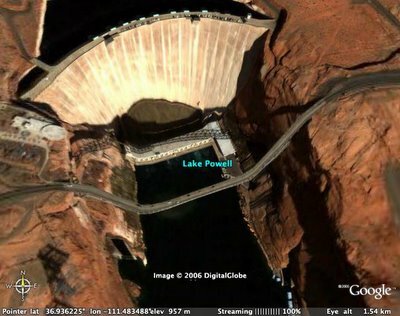 Lots of cool new Google Earth stuff from a Metafilter post.